rough track out towards the lake and to the top of the Saddle Sore bluff. to the base of Pines and Neddles. Scramble up gully on left side of buttress. Then up the chimney till you pop out onto a ledge 10m from the top. Bridge up corner above chimney to the top (some loose rock). The obvious splitter hand crack in the middle of the buttress. Climbed “on site” this is one of the best crack lines in the N.I. Traverse into the crack from the ledge out right (Direct start though roof has yet to be done). Climb to ledge then up the steep crack line above. Belay off trees. 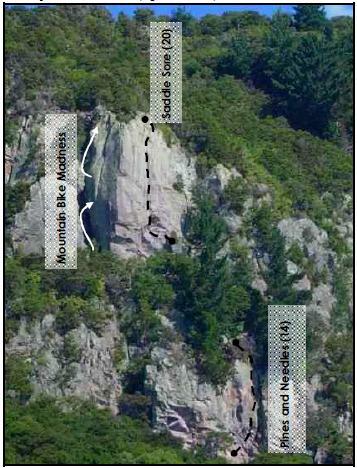 From the base of “Saddle Sore” either scramble down ledge system to the right or abseil down to lower tier. Climb the obvious wide corner system at the right hand end of the cliff. From the top of the corner cross the pine needle covered ledge then up the small head wall to the top. Trad Belay.